The School Software to manage your school as you want, starting from admissions to attendance and exams to result cards. School Management Software simplify and automate daily tasks and operations with out of the box of school software. FeKara is a Web Based Application A free school software which is always online, that means you can access it on your phone, laptop or computer from anywhere. There is no additional setup required on school premises, no need to take care of your backup as well as data securing. All you need to do is to sign up for a free account and start using it. feKara is Developed for End-users: if you have a basic knowledge of computers and you know how to send email, it will take 15 minutes to get familiar with fekara features. feKara is Free School Software for All: Fekara’s pro version is Totally Free for nonprofits, the basic version is free for all educational institutes; as our commitment towards a better school management system. feKara School Administration Software offers one common database and configurable user profiles, allowing administrations, teachers, students parents to share the information with each other. We have engineered feKara to be highly customizable to cater the specific needs of your institute. Use feKara on your mobile phone or tab. We have designed phone version for Institutional Heads on the move. Want to start using feKara, all you need is a computer (or handheld device) and an internet connection. There is no need for any extra setup. Cloud means that you can put as much school data as you want. You can trust Fekara to store your data. It is built on security guidelines for modern web applications. We make daily backups of your data and you have also options to take your own backups. No school can start using management software without a professional support for the software. Our support gets you started by helping you import existing students & other records. Our multi-channel support includes email, ticketing system, Whatsapp, and Phone. Fekara has more school app features than any other online school management system in the market and is practical and widely used. And it is still enhancing. You will be auto-updated as new features are added. Fekara is available as Free School Software and we also have pricing plans for institutions of different sizes. You can start with free plans and can upgrade to paid when required. feKara is a multi-lingual school management software, it easily translatable into your own language. We have made an even a web interface that allows you to easily translate or rephrase or change any label/ text to suit your school needs. it will take 15 minutes to get familiar with feKara. It doesn’t get easier than that. Keep your school sleekly running with feKara. With modern era features like “online student registration” to traditional admission system, attendance, exams, and in detail management reports. feKara school management system equally beneficial for small and medium-sized schools alike. Having feKara school software, you keep your school organized. Your day to day tasks and reports are automated saving your administrative resources. School Administration System has never been easy and clutters free before. Extremely detailed student reports for students and grade books, financial reports, profit-loss, salary payments, and a bunch of other school management reports. Most of the reports can be scheduled for delivery through email and SMS (summary versions). feKara offers a flexible interface to incorporate any fee structure. Even instant and recurring discounts & fee groups can be implemented, along with late fee and other fines. Finance is a complete different trait than school management, and for that reason, we have carefully implemented accounts in most simple forms. For professional accounting needs, data can be exported to be incorporated into your dedicated accounting software. Communication being the core of any management system for the school is very well handled in feKara. Whether your organization is a school, a coaching center, or a kinder garden, one thing stays of utmost importance. i.e. The need for effective communication with the parents. feKara has multiple ways to communicate with parents and students while keeping the management in the loop. Today students and their parents are on the go. 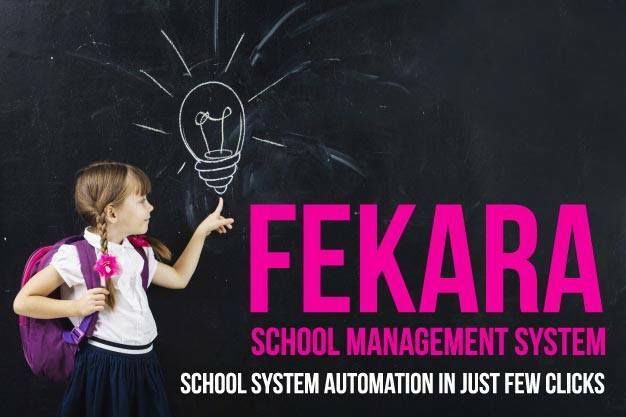 feKara management software for school comes with intuitive parent portal, where they can see they can monitor the study of all their children and communicate with their teachers and school management alike. On the other hand provide your student with a single access point for all the course material, assignments, grade books, and their overall progress chart. Over 3,000 schools of all sizes from 82 countries trust us.